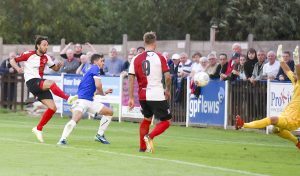 AFTER three straight wins, Woking suffered their first defeat of the season away to Wealdstone on Monday night, writes Andy Fitzsimons. Matt Lench’s 84th minute penalty proved to be the difference, at least on paper, between the two sides; albeit The Cards were completely outplayed in the second half and lucky to lose by just a solitary goal. With the hosts shaping up in a narrow, but conventional 4-4-2 formation, Woking made the most of the wide space, with Nicky Wheeler and Max Kretzschmar both seeking to exploit down the flanks. Former Stones’ defender Ian Gayle came close to opening the scoring, but his close-range header fell straight into the hands of Jonathon North inside the opening 10 minutes. Paul Hodges probably should have done better too after he scuffed his shot on the turn as Woking looked the more likely to score. The Cards were then denied a goalscoring opportunity when Stones’ defender Rhys Tyler shoulder-barged Hodges in the box, to which Jacob Miles, the referee, remarkably turned a blind eye. As the half wore on, Wheeler failed to make the most of his one-on-one with North, as his final effort was cleared off the line. However, when striker Jake Hyde lipped off seven minutes before half-time, it marked a turning point in the match. In contrast to the first period, it was an awe-inspiring second half performance from the north-west London side, as Woking struggled to get out of their own half. Connor Stevens headed just wide, then Wadah Admidi dinked his way past two defenders before his shot was eventually charged down by Kiran Khinda-John. With The Stones laying siege to Woking’s goal, the final pass was often amiss as the visitors managed to scramble the ball away several times. A snap-shot from Rhys Tyler’s was then brilliantly palmed away by Berti Schotterl. But when David Pratt was upended by Khinda-John in the box, there was only likely to be one outcome. With regular penalty-taker Danny Green off the pitch, substitute Lench stepped up to take the penalty-kick, which he slotted home with ease to give Wealdstone the lead. Woking’s woes then went from bad to worse when Daniel Spence was sent off in stoppage time for a second bookable offence, as the hosts played out the remaining minutes to claim all three points. WOKING: Schotteri, Spence, Casey (c), Khinda-John, Gayle, Colliers, Hodges (Saraiva, ‘62), Ferdinand, Hyde (Ofori-Acheampong, ‘41), Kretzschmar. Wheeler (Young, ’73). Unused subs: Cook, Mason (GK).